Today in Masonic History Charles Fergusson, 7th Baronet passes away in 1951. Charles Fergusson, 7th Baronet was a British soldier and politician. Fergusson was born January 17th, 1865. He attended Eton College and the Royal Military College at Sandhurst. After graduating, Fergusson joined the Grenadier Guards in 1883. He served in the Sudan and in 1899 he became the Commanding Officer of the 15th Sudanese Regiment. In 1901, Fergusson was named Adjutant General of the Egyptian Army. In 1907, Fergusson became a Brigadier-General on the staff of the Irish Command. In 1913 he became the General Officer Commanding the 5th Division in Ireland. This position put him in the middle of the Curragh incident, also called the Curragh Mutiny. The Curragh incident occurred as Ireland was gaining more ground toward self governance. Members of the British military who opposed this transition, for a variety of reasons, threatened to resign or not follow orders given in support of the transition. Fergusson was in command of a variety of units throughout World War I. After the war he would become the military Governor of Cologne before retiring in 1922. 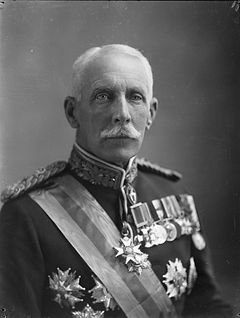 In 1923, Fergusson was appointed Governor General of New Zealand. It was a position Fergusson's father had held and Fergusson's son would be the last British appointed Governor General of New Zealand. Fergusson passed away February 20th, 1951. Fergusson was the Grand Master of New Zealand from 1925 to 1928 during his term as Governor General.